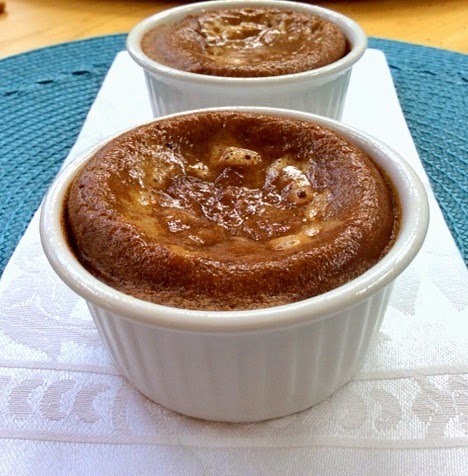 Watch out, pumpkin pie and make room for this GF/DF and Grain Free Pumpkin Souffle! This dessert is delicious even without a caloric crust. Of course this makes a fantastic brunch or breakfast as well, as it is light and flavorful and a great source of high quality protein. Additionally, feel free to change this recipe up by eliminating the cinnamon, clove, nutmeg and maple syrup and replacing them with savory spices like sage, black pepper, and a bit more sea salt to make this a savory side dish. Whisk the canned pumpkin, eggs, coconut oil, almond butter, maple syrup, and vanilla extract together until well combined. Sift the coconut flour, baking soda, cinnamon, nutmeg and clove into the wet ingredients and continue to whisk until well combined. Bake in the center of the oven for 25-35 minutes or until the entire souffle puffs up and the center no longer appears wet. Wow, this looks delicious. Thank you so much for sharing with Gluten Free & DIY Tuesdays!! Thanks you and thanks for hosting DIY Tuesdays! This sounds delicious for Fall! I love the idea of making it a savoury dish by eliminating the cinnamon and "pumpkin" spices and adding pepper, sea salt, and sage, making it a totally different dish. Pinned! I would love to feature this on Sunday Snippets, but I do not see a link back to Fat Tuesday. Sorry about that! My oversight. All linked up now! Thanks for visitings! That looks wonderful! Love pumpkin. FYI - We're featuring your awesome post at this week's Motivation Monday party! Thanks Barb and thank you for hosting Motivation Monday! How much vanilla - 1/2 tsp? 1/2 TB? 1/2 teaspoon. Sorry for the typo. Thanks for visiting!